revdarkwater goes to his Mom and Dad’s home. See revdarkwater go! He sheds stuff for them. Shed, revdarkwater, shed! More stuff rains down into his cluttered life. I like snakes … except for cable snakes. Capulum datum were virtually unknown as recently as a hundred years ago, but in the last few decades have spread quickly throughout the developed world, till they have become quite common and frequently invasive. Look for them in disorderly tangles under desks near computer equipment. We’ve had a terrible infestation in our home office. 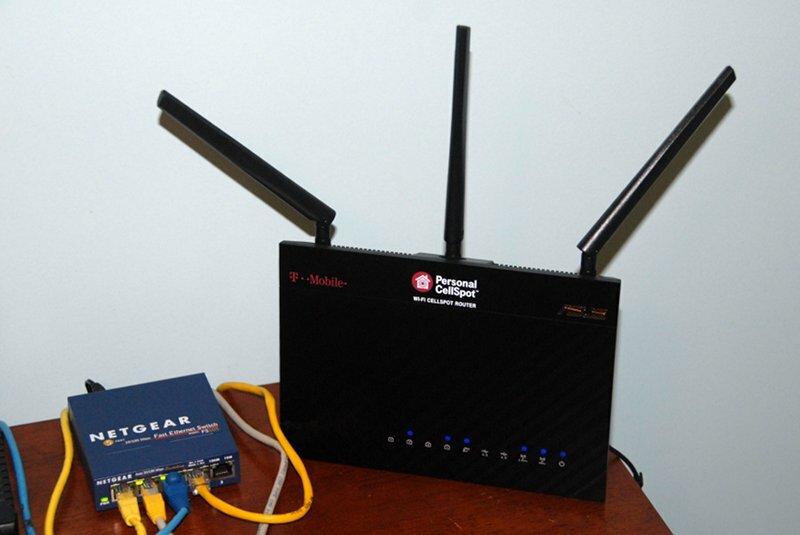 But our wireless carrier just sent us a state-of-the-art wireless router to help resolve our WiFi calling problems. * I’m happy to report that, along sorting out the snakes, I’ve also shed some connectivity problems today. But back to the snakes—installing the router provided a nudge to confront them in their den and charm them into better order. Less clutter yields a lighter heart! 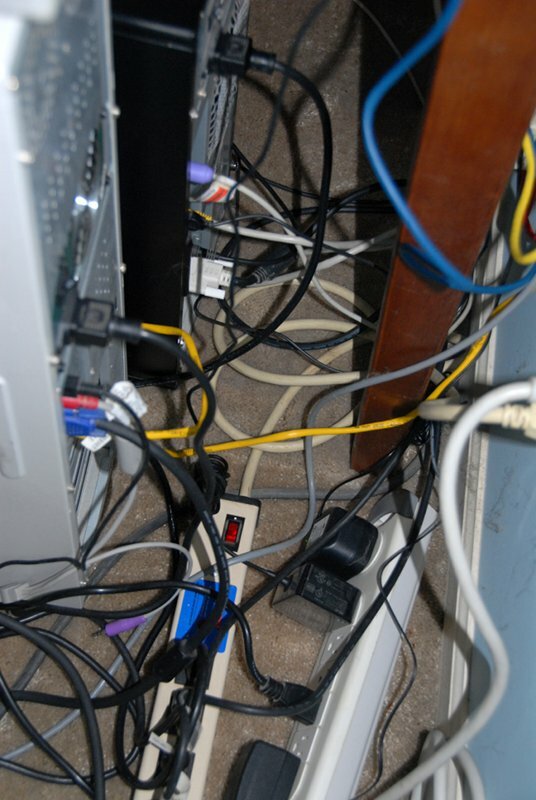 Though the untrained eye might be deceived, this is a straightened-out nest of cable snakes. *I feel a slight disquiet at urging you to bring something else into your space, but if you’re in the US, T-Mobile is your wireless carrier, and you have a phone that supports WiFi calling, I recommend you hit one of the hot pink stores or call customer service to ask for a TM-AC1900 CellSpot. The only cost to customers is a $25 deposit, which is refunded when the device is returned. These are $200 dual-band wireless routers with advanced features, but T-Mobile is essentially giving them away so they can shift traffic onto cable rather than having to carry it over the air. I don’t work for T-Mobile nor do I have any control over any advertising that may appear on WIST … I’m just grateful and glad to hold my thumb up about this cool product. From the southeast corner of our lot, summer and winter, a great mother of an eastern redcedar (Juniperus virginiana) stands green and tall, watching over all that comes and goes. She’s a gracious host who shares her blue-grey fruits with birds, who repay by sowing her children wherever they … er … go. Sometimes, that’s not very far away. 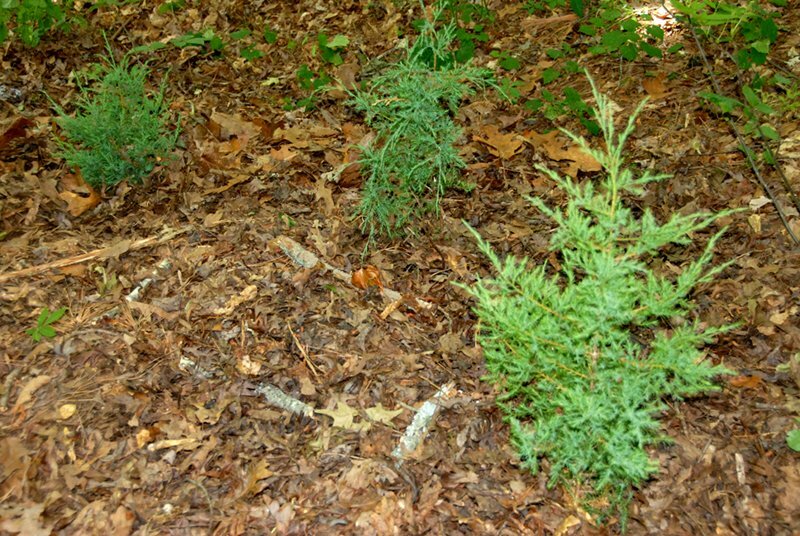 Thus we enjoy a constant supply of juvenile junipers, which come up in the woods (where they’re welcome), beside the house (where they’re not), and in what passes for our lawn (where the mower blades render them bonsai). 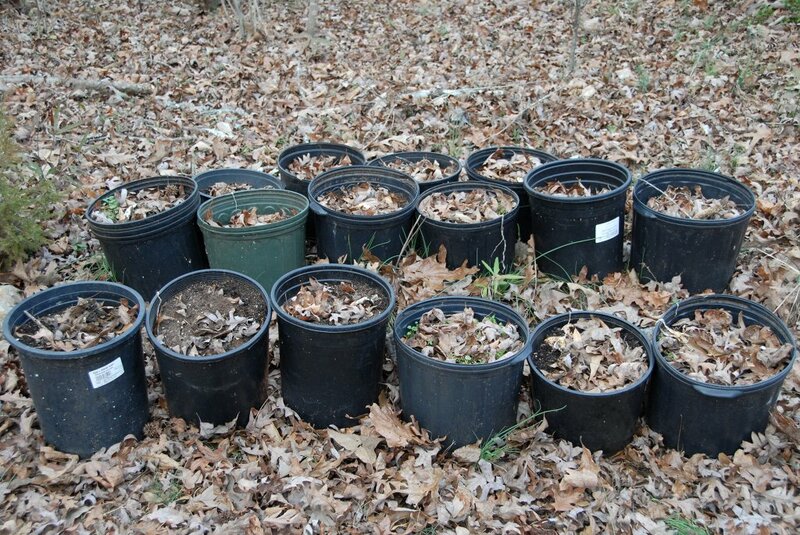 We have a lot of baby white oaks, too—hundreds—which, with regret, I mostly treat as weeds. The redcedars, however, I transplant to the woods out back. There they must compete for soil moisture and make do with little light, but they’re plucky little things, and most survive. Today I moved half a dozen that had sprouted up under the skirts of the crepe myrtle and lilac chaste tree. The three largest get to participate in my hugelkultur experiment. 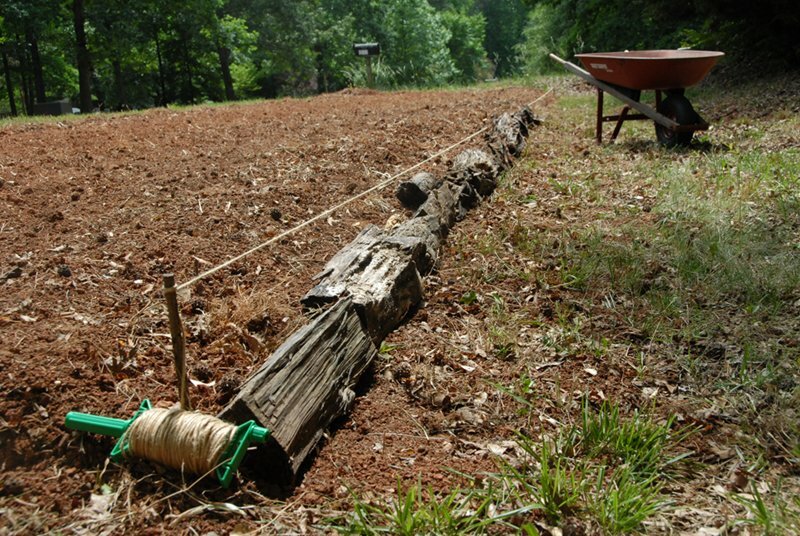 Hugelkultur is, usually, a variation on raised-bed gardening, in which decaying wood is buried under soil improved with manure and compost. It serves as a source of some nutrients, but mostly acts as a sponge, soaking up water when it’s abundant and releasing it slowly at need. 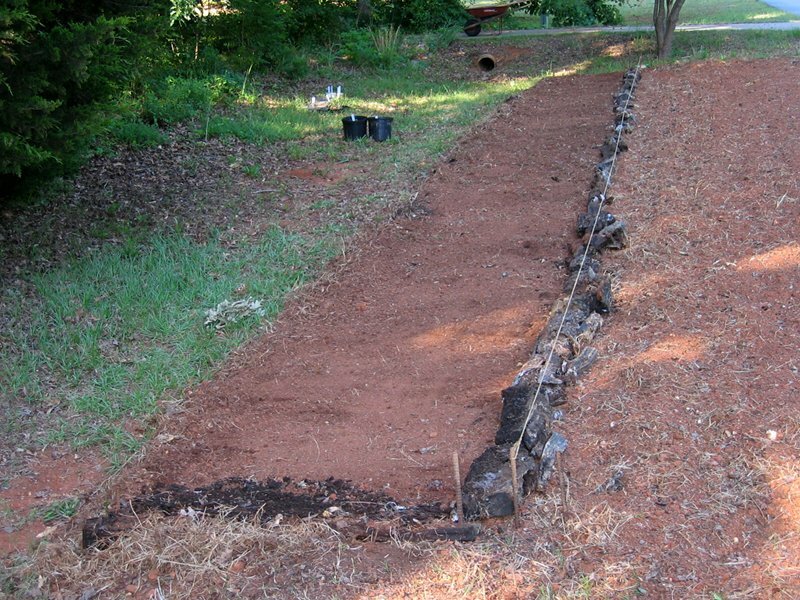 I’m building my hugelkultur mound under the oak-hickory canopy out back, so it won’t get enough light to raise vegetables. But it gives me a place to manage the abundance of dead wood on our property, and to landfill another plentiful by-product of our household. I alternate layers of limbs and twigs, used clay kitty litter, and fallen leaves. I expect the redceders to send roots through it and hold it all together. In any case, in my intentions, they’re now in their place. I hope they like it! Comments welcome … is some godparenting asking for your attention and time? 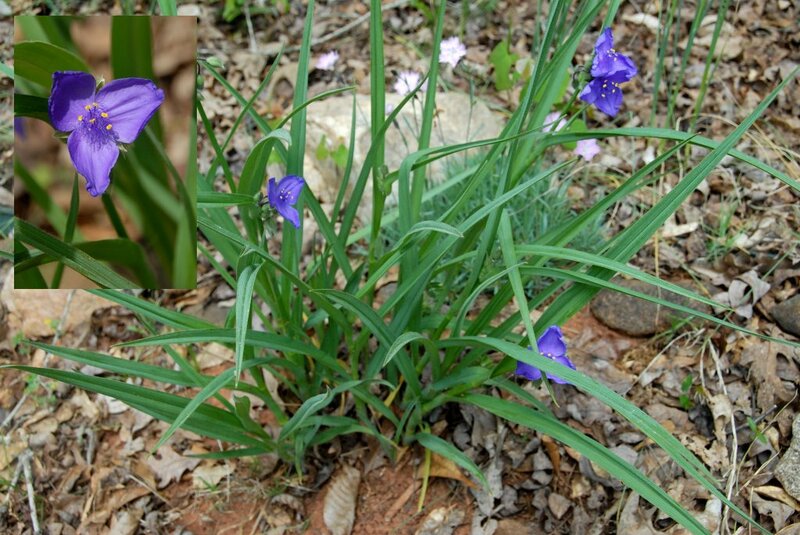 That pretty herb with the blue flower growing on the WIST grounds is Virginia spiderwort (Tradescantia virginiana). Though spiderwort is native to the eastern US, ours were probably planted at the margin of the woods by a previous owner of our property. They have now thoroughly naturalized at the front of our yard, coming up in our minuscule lawn and even appearing in the vegetable garden beds. Since I want neither to till them under nor mow them down, this morning I moved several out of threat’s way. I’m happier with them decorating the edge of the canopy with their fellows. They’ll prefer it, too! Comments welcome … what of yours needs a little better growing room? We don’t light a fire in the fireplace often, but we allow ourselves the treat on an occasional winter evening. A good deal of wood lay in the yard in three separate places when we bought the property, the product of the loss of mature trees. Much of it had turned into mushroom growth medium, but we burnt what we could. I supplemented the fireplace fodder with the fallen limbs that constantly (and naturally) come down. When what was left was truly marginal for firewood, Nimue bought a load from a woodcutter who was selling it off his pickup truck. It was nice fuel, seasoned white oak, cut to stove length. He stacked it neatly in the side yard. At that point our trove consisted of two piles of mostly rotten stuff out back, my collection of sticks and limbs haphazardly tossed upon the firewood rack, and Nimue’s purchase. Then a spring storm wrenched and shattered a large black cherry (Prunus serotina) out front. 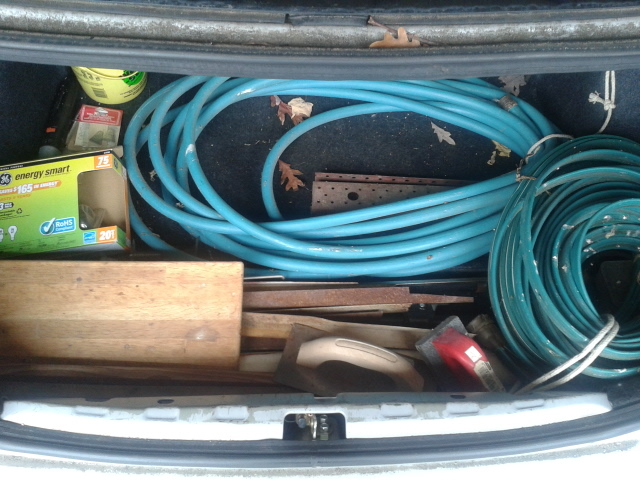 Fortunately, it hung up in a white oak before it hit the tandemobile. We needed the help of a tree cutting service to get it down. They left it in large sections, close to where they landed. And in those separate places most of the wood stayed, except for a bit we burned. I wanted it on the rack, but I want a thousand other projects accomplished, too. And it had to wait on repairing the wheelbarrow. But today the weather was pleasant, the ground dry enough to roll weight across, and I felt like moving wood. A lot of rotten stuff went to our hugelkultur mound. 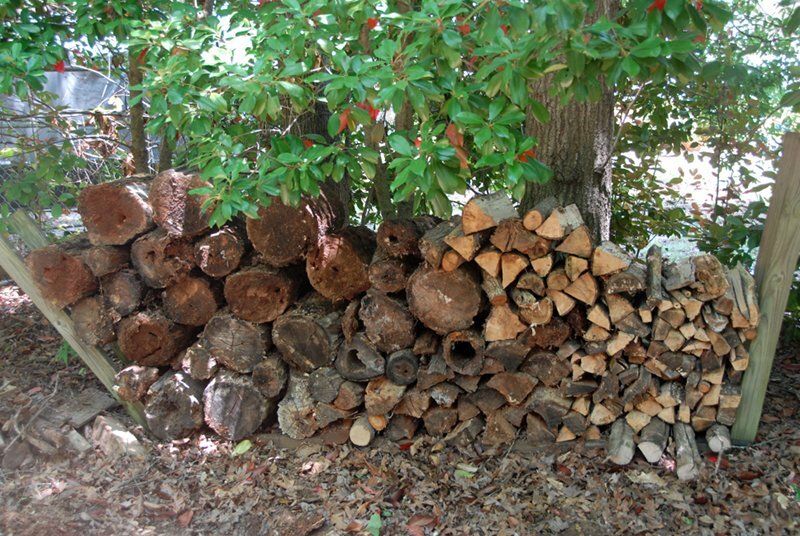 The good wood is now piled on the rack. Nothing left our address, but it looks better and took a weight off my mind. That’s what I shed today. Comments welcome … might you get more of less by combining this and that? Nice winter crop of creeping charlie (Glechoma hederacea) I’ve grown there. Among the items cast under the deck by previous owners of our house was a resin side table. It’s still a little stained by Georgia clay and mold, but it cleaned up well enough I’m not embarrassed to take it to the courtyard at church. That’s where I relocated my container garden so I may grow swiss chard where white-tailed deer shall not break in and steal. The table is of a size to elevate one pot, which will add a bit of visual interest. In moving it from here to there, I haven’t subtracted from the total of belongings I’m responsible for, but it was useless, and now useful. That feels like a shed. Comments welcome … do you have potentially useful property that simply needs to find its proper place? I feel the same about getting a haircut as I feel about shaving: glad to have it done. But I don’t like the process, so I don’t go to the salon more than three, maybe four times a year. My public excuse is that Nimue likes my hair longer, and I let it grow out for her. Which is true, but when it starts to flip up or get in my eyes, I feel unkempt. Still I delay the inevitable appointment with the shears for weeks or even months. Why? Partly it’s because I enjoy saving money more than spending, and I can always defer a haircut’s expense another day. (The beauticians deserve what I pay them, though, and more, so I’ve started tipping.) Partly it’s that, like-able as the staff are, I have to let someone I don’t know well into the bubble of my personal space. And partly it’s because getting a haircut interrupts whatever plans I’m pursuing, though I interrupt myself a hundred times a day, and generally don’t regret the moments of grace in which I stop to smell the roses. Whatever … today I shed some hair. 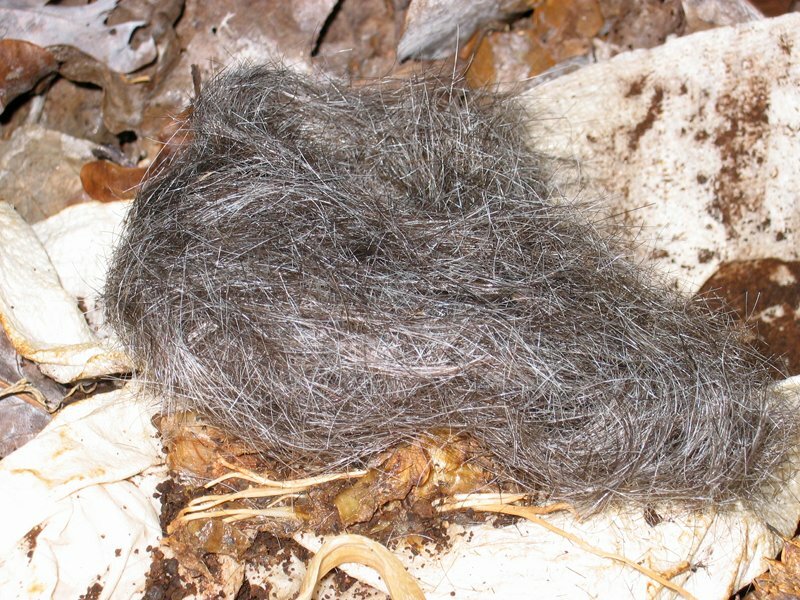 Always before I’ve walked away from my fringe on the floor, but today I asked if I might have it to feed my compost pile. Hair is a good slow-release source of nitrogen, some 15% by weight. That’s more than manure. Aren’t you glad you learned that? This isn’t a shed so much as it’s relocating something to a better place. But since the move is likely to change the status of a whole system from “broken and making me mad” to “working and increasing my cheer,” I’m counting it. Our yard is a fairly mature second-growth oak-hickory woods. The only space I have enough sunlight for a garden is a narrow strip out by the street. 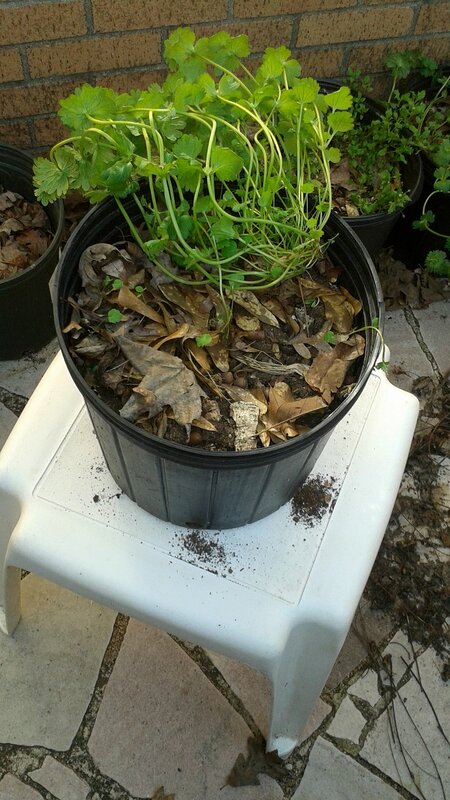 I supplement it with planters full of home-made compost. Every spring and fall I get my blood pumping for another try, but onions and okra are the only crops I’ve successfully grown. Mostly, I just feed the white-tailed deer in our neighborhood: two does and a fawn that form a little herd and a solitary yearling buck. I’ve observed them often enough, long enough, to have named them: “Sausage,” “Stew,” “Bambi,” and “Steak.” They don’t know it, but we’re in an undeclared state of war. At church, however—twelve miles away—there’s an enclosed courtyard right outside my office window. I defy Sausage and her voracious get to find my container garden there.